Aviation Updates Philippines - Cebu Pacific Flight 15 from Dubai to Manila made an emergency landing at Hyderabad Airport, India due to a mother on labor. 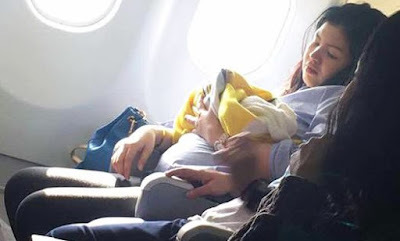 The airline celebrated the birth of a baby girl, Haven, while the flight was halfway from Dubai to Manila. The flight crew of CEB flight 15 from Dubai to Manila on August 14, 2016. Cheers to the flight crew! Photo by Cebu Pacific Air. According to Cebu Pacific, the healthy baby girl was born four hours after departure from Dubai on Sunday, August 14, 2016. Cebu Pacific cabin crew and two nurses on board assisted in the delivery of the baby while in-flight. Baby Haven was the first to be born on one of its planes. To ensure the safety and comfort of the mother and her baby, the flight was diverted into Hyderabad Airport in India. The baby was born 32 weeks premature. The mother and the baby is being taken care of CEB's Customer Care team. Mother and her baby named "Haven". Photograph by Missy Berberabe Umandal on Facebook. One of the passengers on board, Missy Berberabe Umandal, posted on Facebook that she did not mind the delay. “It only happens in movies, and we’re lucky to witness this miracle,” she wrote. "We are happy that both mother and daughter are doing well, and would like to commend our flight and cabin crew for handling the situation with utmost professionalism and efficiency. We also express our sincerest gratitude to the two volunteer nurses who helped ensure the baby's safe delivery," says Lance Gokongwei, CEB President and CEO. "To celebrate this momentous occasion in the life of one of our passengers, CEB awards Baby Haven one million GetGo points, which she can use to fly with us for free," he said. GetGo is CEB's lifestyle rewards program. The baby's points have no expiry, and may be shared with her family. To earn 1 million points equivalent to the GetGo points given to Haven, a passenger will most likely spend at least P5 million. The points can be used for travel to Cebu Pacific's extensive route network of 36 domestic and 30 international destinations. Source: Cebu Pacific Air, The Guardian.